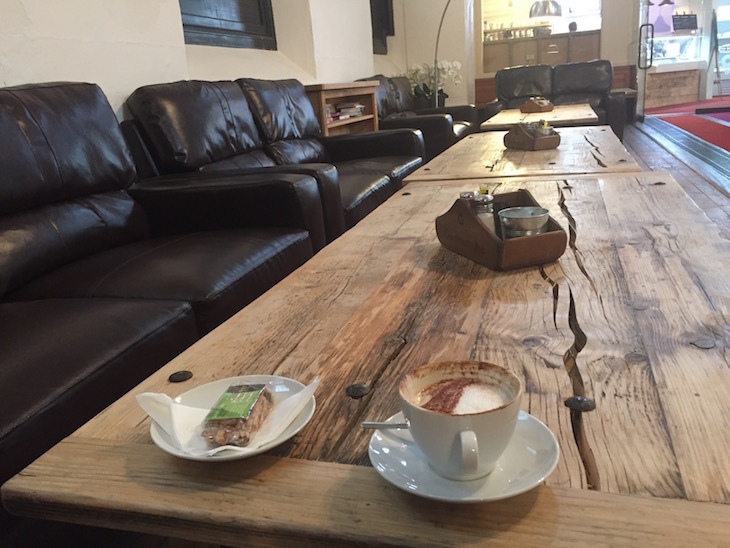 What must be Holborn's most relaxing cafe can be found within the nave of St George the Martyr, on the south-west corner of Queen Square. 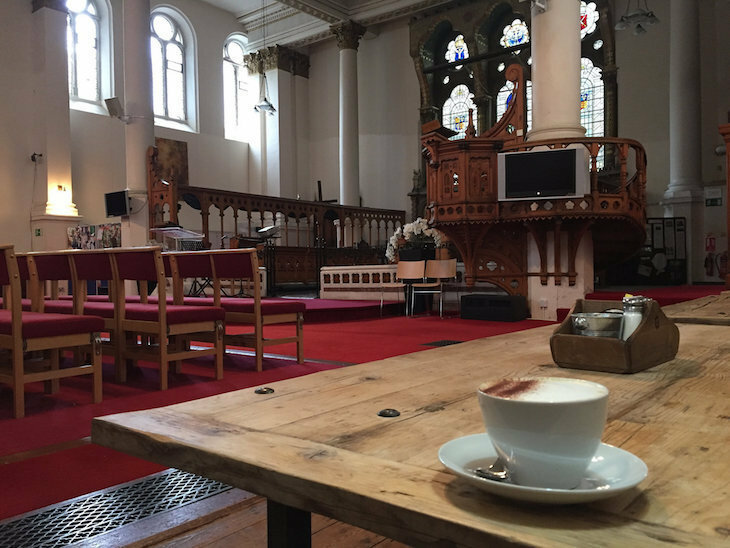 It's a church — a functioning church — that also serves as a cafe. Few people know about the place, judging from the paucity of customers on the three times we've stopped by. It's a rare pocket of peace in an area dominated by the roaring Southampton Row and, beyond, the British Museum. 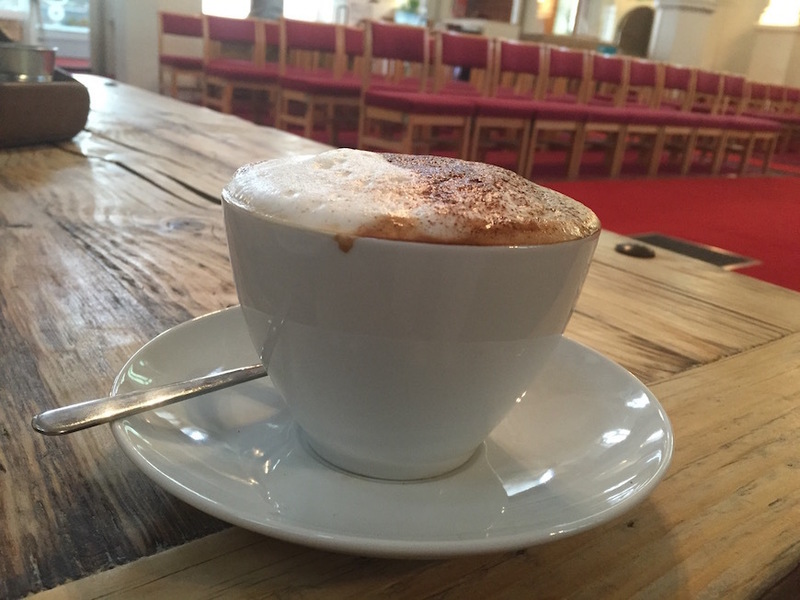 St George isn't the only church to boast a cafe, of course. But most, like St Martin's and St Mary-le-Bow, guide their diners down into crypts or off into side wings. All very good, but St George seats its customers in the nave itself, right up to the pulpit. The food and drink offering are pleasant enough, though nothing too exciting. A foaming cappuccino like the one pictured will set you back £2.50 to drink in (and you definitely do want to drink in). A small range of sandwiches, fruit and salads are also available. The church has plenty of history to contemplate while you're here. They used to call this place the chimneysweeps' church, on account of a special sermon held here for those of the sooty trade. William Stukeley was rector for a time — he's the chap who revived interest in Stonehenge during the Georgian era, and is a familiar name to students of London history. Perhaps most notably, the church was the venue for the wedding of Sylvia Plath and Ted Hughes in 1956. Seating is on big leather sofas, with over-sized wooden tables and a scattering of books to browse. There's a strong Wi-Fi signal via BT for anyone looking to flourish their laptop. Next time you're passing through Bloomsbury and fancy a cuppa, ignore the numerous chain shops along Southampton Row and dip into this gentle refuge — an understated splendour of Corinthian white and gold.